Monday morning's dense fog created problems for many people across the Central Valley. 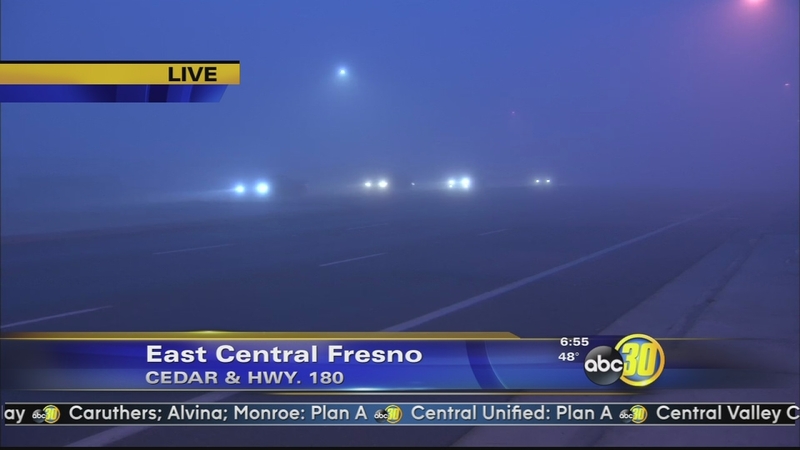 FRESNO, Calif. (KFSN) -- Monday morning's dense fog created problems for many people across the Central Valley. Drivers traveling on Highway 99 between Fowler and Selma encountered very low visibility. In many parts of the Valley, visibility was less than 100 feet. The fog also caused problems at Fresno Yosemite International Airport. Throughout the morning there were nearly a dozen flights that were delayed or canceled. A family Action News spoke with says their flight back home to the East Coast was canceled. Now they're going to spend an additional night in Fresno. "We were supposed to leave at 6:15 this morning to get to Rochester, New York, by 6 o'clock this evening, so we'll be heading out tomorrow morning," said Jessica Moore of New York. At last check at least four flights coming into Fresno were canceled and at least nine were delayed 30 minutes or more. Also in East Central Fresno we spotted dozens of kids headed to school. The fog didn't keep many from walking to class. More than 30 schools across the Valley were on a Foggy Day School Schedule, and Oak Valley Union Elementary School District even canceled class for the day because of the conditions. The dense fog made for a very difficult drive in the Central Valley Monday morning.